Major James Joseph Comerford (1899-1950), BSc, BE, MSc, MICEI, was an Irish military engineer and an expert in fire engineering. He reorganised the Dublin Fire Brigade in the 1930s and was the superintendent of the Dublin City Fire Services during World War II. James Comerford was born in Urlingford, Co Kilkenny, in 1899, the son of William Comerford (1871-1960), national school teacher, and his first wife Honora (nee Maher) from Cashel, Co Tipperary. He was a brother of Father Michael Comerford (1903-1997) of Rockwell College, Co Tipperary, and a half-brother of Father Frank Comerford of Kimmage Manor, a former Spiritan missionary in Kenya. James Comerford was educated at Rockwell College and University College Dublin. He graduated with the degrees BSc and BE degrees in 1921. From 1921 to 1922, he was a Demonstrator in Geology at UCD, and in 1922 he received the MSc degree. In the same year, he joined the Irish Army as a junior subaltern in the Railway Protection, Repair and Maintenance Corps, and was a lieutenant based in Thurles, Co Tipperary, during the Irish Civil War. A year later, he transferred to the Corps of Engineers with the rank of captain and was posted to the Curragh Command in Co Kildare, where duties he was placed in charge of the Curragh Military Fire Brigade. He was elected an associate member of the Institution of Civil Engineers of Ireland on 5 January 1925. In that same year, he was recalled to Dublin and was promoted to the rank of commandant, later returning to the Curragh as commandant of the School of Engineers and chief instructor in engineering at the Military College. He lived at Annanaar, Clonskeagh Road, Dublin, from 1928. He became a full member of the ICEI on 2 November 1931. 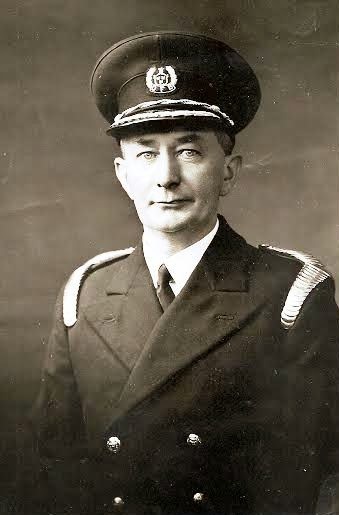 In October 1937, he was appointed director of military engineering with the rank of major. The following year he was seconded from the Army to take over and reorganise the Dublin Fire Brigade. In November 1939, he was appointed superintendent of the Dublin City Fire Services. Throughout World War II, he was responsible for air raid protection and for the formation and training of the auxiliary fire service throughout Ireland. He is particularly remembered for his role during the German air raids on Dublin and for his response to the air raid attacks on Belfast during World War II. He delivered a paper on air raid precautions on 3 March 1941, and another on structural aspects of fire resistance on 5 March 1945. After World War II, he was living at Annanaar, Clonskeagh Road, Dublin, in 1946. In March 1948, he was appointed fire adviser to the Minister for Local Government, a post which he held until his death in 1950. 1, Irene (‘Renee’) (1933- ). She was born on 23 May 1933. She married Richard Frances (‘Richie’) Lyons, (died 5 December 2012). They lived in Sutton, Co Dublin, and he was President of Clontarf Rugby Club 1980-1981, and played cricket with Clontarf Cricket Club. They are the parents of two sons and two daughters. 2, Michael James Comerford (1939-2010). He was born in 1939. He was an avid sailor and boater and a Past Commodore of the Grosse Pointe Sail Club, Michigan. He died on 19 December 2010, aged 72. He and his wife Maureen O’Leary are the parents of a son, Eoin Comerford, three daughters, Grainne, Ciara and Niamh, and have four grandchildren. 3, Kieran Anthony Comerford, BE, MBA (1944- ), who married Lynda Byrne, musician, and they have two sons. He was educated at Rockwell College, Co Tipperary, and University College Dublin. He is a retired technical consultant and the author of a number of books, including Newgrange and the New Science. Much of the information in this profile of Major James Comerford is based on his obituary in the Transactions of the Institution of Civil Engineers of Ireland 77 (1950), p. 174. A brief obituary was also published in the Irish Builder, 92 (30 September 1950), p. 1058. Transactions of the Institution of Civil Engineers of Ireland 51 (1926), p. 60. Transactions of the Institution of Civil Engineers of Ireland 58 (1932), p. 1. Transactions of the Institution of Civil Engineers of Ireland 67 (1941), pp 123-144. Transactions of the Institution of Civil Engineers of Ireland 71 (1945), pp 161-182. University College Dublin: Register of Graduates (1946), p. 27. Irish Builder, 90 (20 March 1948), p. 206. Kevin C. Kearns, The Bombing of Dublin’s North Strand, 1941 (Dublin: Gill & MacMillan, 2009). Donal Fallon, ‘When Dublin responded to blitzed Belfast’s may-day’, History Ireland, 19/3 (May/June 2011). email correspondence with his son, Kieran Anthony Comerford, 27 and 28 August 2014, and 4 September 2014. Last updated: 19 September 2009; 3 and 4 September 2014.